In participation with the PGMom program. Complimentary product was received. Opinions and comments are honest and my own. When it comes to our children's health and well being, parents want to overload their brains with information. We want to know every trick we can learn about taking care of our kids. We aren't experts but there are ways of coming close with great resources found in books shared by the experts. Pampers wants to arm parents with the knowledge and resources to promote baby's happy, healthy development. The A to Z of Children's Health book is sure to become parent's go-to health and wellness guide. Its an indispensable reference that will solve every parents health queries. This is a great book for every parent or caregiver to have on hand for the day to day issues they may encounter raising their little ones from birth to 10 years old. 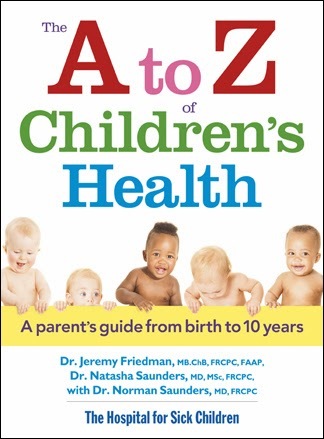 A to Z is a comprehensive, up-to-date, evidence based book written by trusted experts at SickKids (SickKids Hospital in Toronto), Dr. Jeremy Friedman and Dr. Natasha Saunders with Dr. Norman Saunders. Inside you will find an amazing mix of practical advice, tips, strategies and more focusing on what parents can look out for, what they can do and when they need to seek medical attention. There are real case/examples and answers to FAQ, full colour photos and detailed illustrations throughout. Information about every health concern you can think of from how to deal with allergies, common colds, cough & congestion, how to recognize and treat various skin rashes as well as when you need to be concerned about tummy pains, headaches, how to handle learning disabilities, bullying and so much more. There are so many subjects in this book that I wished I had known more about when we had our first baby back in 2004 like how to deal with teething, temper tantrums and potty training. There is a good section about bullying and cyberbullying too that gives some great advice to parents on pages 102-103 of the book. Tips like opening the lines of communication with your child and the school about the issue, noticing signs like mood, behaviour, or academic performance and asking your child about bullying, to name a few. You can learn more about The A to Z of Children's Health book by visiting www.robertrose.ca. Show some love by Liking the Robert Rose Facebook Page and following @RobertRoseBooks on Twitter! I'd like to see pictures of what chicken pox looks like. I'd give the book to my daughter. I would keep this book for myself. I'd like to see tips on how to treat ailments naturally. I'd like to see information on ear aches. If I won, I'd keep the book for myself. I have no idea as I have a 1 month old, so I think this would be handy for hubby and I! I would love to see Rashes! I can't believe how many different types of rashes there are that kids get. I would like to see information on all different types and what to look for. I would keep it for myself. I would like to see something on the important of the immunization shots. I would give this to my friend who is expecting in January. A section on natural remedies. I would give this to my next door neighbour. If I was lucky enough to win I'd give this to my daughter who is expecting in the Spring. It would be nice if there was info on natural remedies to treat eczema. Teething remedies! I've got two boys so I'd keep it! New Scentsational Singles from Gain! Skwooshi - Let's have some fun! Smartrike Zoo Tricycle for baby's first trike! RYOBI tools for the DIYer! The Healthy Shopper Winter 2013/14 Season Picks! Perfect your look with Pantene and COVERGirl! Give the gift of SUBWAY and get a free sandwich! Stuff your stockings with Hasbro!